I hate to say it, I feel a little selfish today. I've been Christmas shopping for weeks now and there's been so much Christmas everything. Frankly, I'm tired of it at this very moment! No more gold, red, and green for me today nor for you! 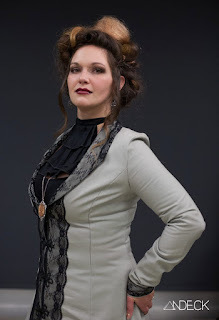 Let's be a little self-indulgent and look at these beautiful pieces of clothing by Fogg Couture on Etsy! 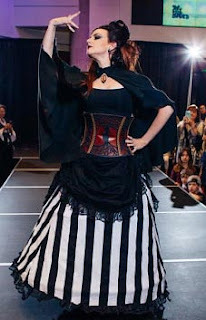 She might be a little too "steam punky" for some, but there is some gorgeous dark Victorian fashion displayed as well. What I would give to have this whole outfit! 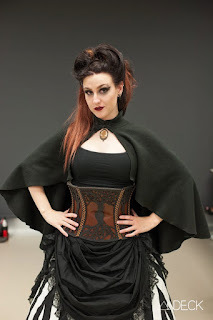 The Black Capelet will have to do! It is made with soft brown fleece that is light, but warm at the same time. It has a single frog on the neck so that you can attach. The cape is "free sized". This would make a great addition to many of my outfits! It's perfect for this time of year, because I would love to wear one of my dresses, but don't want to be bogged down by an enormous jacket. Light weight, warm, and dark? Sounds perfect to me! This piece is absolutely stunning. I wish I could make something as fabulous as this Tree of Life Corset. My artistic abilities just cannot compare to the beauty of this corset. It is made from 100% leather and hand laced. 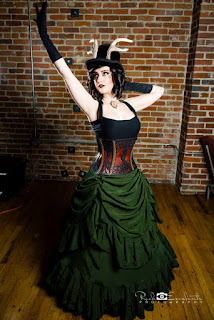 The seller recommends wearing this corset over another one. The size ranges from a size 4-8. The piece speaks for itself and I am incredibly tempted. I know I said I liked the capelet and I do, but if I was feeling frivolous enough I would buy this Gray Victorian Winter Coat. The coat is trimmed with black lace along all of the edges of the coat. There is a black lace fishtail insert in the back of the coat. There are frogs on the front and the back has corseted lacing. They run from sizes 4-10 (US) and made from durable duck canvas. The only unfavorable aspect is that it is not lined, you have to specially request it be lined for extra money. It's a delectable coat! What a cute Tim Burton Inspired Shirt. The cool thing about this one is that it is made with a light cotton blend which is incredibly breathable and the back is laced like a corset so it can fit many sizes. The recommended sizes are a size 2-6 (US). 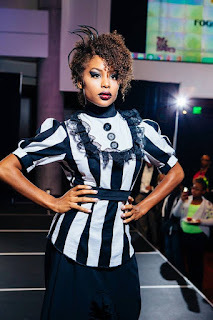 I love the Beetlejuice look of the outfit and wish I could pull it off. I'm sure one of you beautiful ladies would be able to! I would love to see! 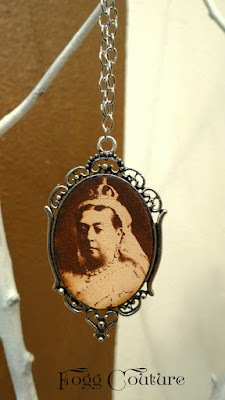 To top these beautiful pieces off, I figured I would show you this glamorous Queen Victoria Pendant Necklace. It is a handmade item made with leather and laser technology to create this pendant necklace. The pendant is about 3 inches in height and about 2 inches in width. It is silver and very intricately detailed. It almost looks like you're looking through a very Victorian styled mirror. I hope you enjoyed your Christmas break as much as I did! Check out Fogg Couture's other items on Etsy, they are incredible! Tell me what you think below in the comments section of this blog! I'd love to hear about it.